Allergy Center Building 1, Counter 3, Internal Medicine Dept. Allergies are on the rise all around the globe, including in Thailand. A decade ago, the rate of asthma among children in Bangkok was 4.2 percent. Today, that figure has increased to 13 percent and continues to rise. Another common respiratory allergy, sinusitis, is now present in 20 percent of the local population. Meanwhile, more and more people are showing signs of food allergies, some of them severe enough to be life-threatening. Several factors are contributing to the dramatic increase in respiratory allergies in Thailand. Air pollutants such as sulfur dioxide, dust from the streets, cigarette smoke, industrial plants and vehicle exhaust from Bangkok’s congested roads all add to the disturbing trend. Changes to the local lifestyle have also exacerbated the problem. Traditional Thai homes are open to the surrounding air and natural environment. In contrast, many contemporary, Western-style homes are poorly ventilated and contain pets and carpets filled with dust and mold. All this ensures that inhabitants are continually inhaling a steady stream of allergens, thereby stimulating the body to produce antibodies. Our highly trained team of specialists at Samitivej helps provide accurate diagnoses for respiratory and other allergies, as well as fast treatment for immediate relief. Not only provide diagnosis, but medical treatment by the best allergy doctors in Bangkok paying great attention to all procedures, so that you have a fresh life again. Samitivej Hospital in Bangkok has a world-class allergy centre. It’s there that you will find the best allergy doctors in Bangkok. Our Team is led by Emeritus professor Pakit Vichyanond who expertise in allergies, together with the expert medical team to provide treatment of allergies in the nose, eyes, skin, food allergy, asthma, sinusitis etc. We will provide knowledge and understanding to the patient about the treatment methods and a good treatment outcome with a complete service in our facility and a close caring team of the best allergy doctors in Bangkok. Give knowledge about the environment control for the allergy patient. Provide the allergy treatment by mean of the allergy vaccination (Allergen immunotherapy). Provide the skin allergy treatment (Atopic dermatitis) with Saline bath and Wet wraptherapy (WWT). 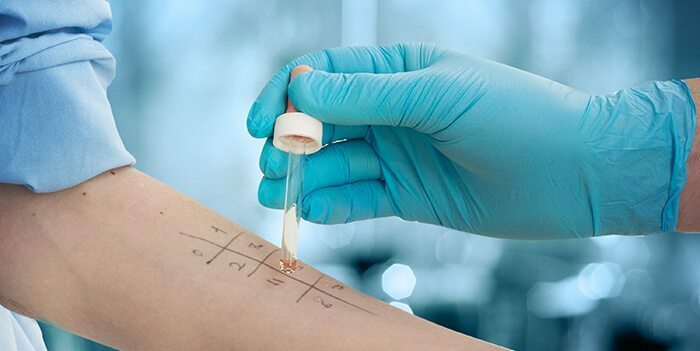 Detect the Primary immune deficiency diseases. Provide medical treatment and consultancy about the unexpected allergy diseases occurring to the chronic patients i.e. sinusitis, conjunctivitis, asthma, urticaria, swollen eyes or mouth, chronic skin infection, acute allergy (Anaphylaxis). Book an appointment with our name allergy doctors in the field of allergy medicine to perform an allergy test for you at Samitivej Allergy Center. Don’t think that children never suffer from the sinusitis. Why is the Moisturizer important?